So it's been a weird summer. Like first it was hot, then it was cool, then it just got clammy and we started to hate/love every one/thing. And that really got us thinking, A LOT, like... is global warming actually really great for my dewy skin? Does Claire's still sell toe rings? Is Bachelor in Paradise the eHarmony of Gen Z? IDK IDK IDK. But one thing we did find out is that the hot dogs at Home Depot are worth at least three Michelin stars. 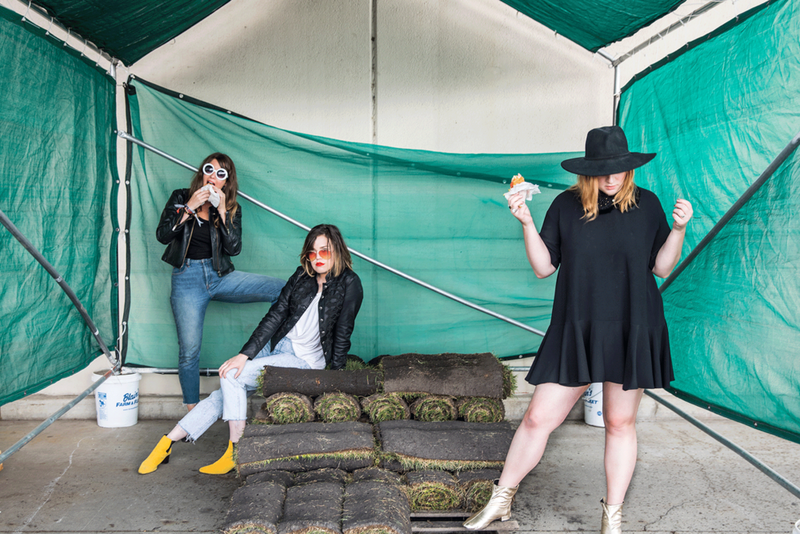 And as you know, we're obsessed with ourselves, soooooo we mirrored our three-star spirit animals of the solstice, Este, Danielle and Alana of #HAIMtheBand, to try out the weiners next to a lot of wood, double yum! PRO tip #1: UPGRADE YOUR stains TO COUTURE by coordinating YOUR looqs with THE condiments ON YOUR DOG. It's complementary and distracts others from your MULTIPLYING CHINS! AND IF YOU'RE WONDERING... YEAH, WE DID GET THEM WITH KETCHUP. Is this what 'normal bloggers' do? It's important to note that when it comes to managing finances, power tools, or any musical talent, we have absolutely no idea what we're doing. So we decided to head to aisle seven and strum a drill (is it a drill? is it a gun? does Home Depot have a liquor license?????!) like it was Reading Fest 2017. Pairing our DeWalt-inspired boots with Haim Depot brand colored glasses, we were able to black out in fear and eventually check off that infamous bucket list item: climbing the stair stepper at Home Depot to absolute STARDOM (at least to the other customers and, more importantly, ourselves). It's a long road to celeb status, my friends. And it involves a lot of MSG. PRO TIP #2: food comas are inevitable, so glitter your F*cking lids and head to the most sexily #lit aisle in the store (spoiler: it's the lightING aisle). AND contrary to popular belief, dark under eye circles are absolutely not the new milleNnial pink. Spooky! After a brief disco nap in the lighting aisle, we moved onto matters of the stomach--massaging our digestive tracts via Whirlpool washers. It's basically the chiropractor of the appliance section, and, as you know, we're really really really invested in our health. We recommend staying atop the washer for either A) as long as it takes to get a six pack or B) as long as it takes for a store clerk to say "MA'AM PLEASE GET DOWN FROM THERE." PRO TIP #3: Depot dogs are CA$H ONLY, which is r shriek when your only currency is MAXED-OUT plastic THINNER THAN THE SKIN ON YOUR FACE. Special thigh claps to Amanda for covering our $13 bill and YEAH, WE'RE FULLY AWARE that isn't a diet coke. K, now hold your deviated septums while we drop some pickled-onion-breathing HAIM knowledge. Danielle toured with the likes of Casablancas after JENNY F'ING LEWIS discovered her at a jam sesh in Laurel Canyon right after she graduated FROM HIGH SCHOOL. Tell that to your Razor flip phone and L.E.I. denim! (The only person interested in me at that point was the homeless man drinking windshield washer fluid outside the Speedway gas station). Before Este mastered her signature tongue-out-bass-face, she graduated from UCLA with a degree in whatever TF enthomusicology is soooooooooo.... chic for her! Backstage at Coachella or surrounded by fertilizer and flies? Only the orange aprons will know. PRO TIP #4: The Sod Palace™ is just as exclusive as the VIP tent at the Governor's Ball. It has everything: sod, tarps, and even a small step for you to accentuate your "good leg" in photos. If you can't get into the propane tank to really light up your looq, try metallic heels and a quick hair flip. The most inspiring aspect about HAIM is that they DGAF about anybody except each other and Shania Twain, which is how we feel about ourselves versus everyone else in Home Depot (specifically the bathroom, like... can you PLZ GIVE US A MOMENT WE'RE BIZZY). And we all know that Shania Twain quit her job at Home Depot years ago. Step 2: Disregard the fact that you own underwear that says "Let's Do It"
Step 3: Place buckets in front of the brightest wood, allowing your legs to appear tanned to a bronzed goddess HAIM level. Step 5: Stay aware of the fact that that Home Depot employee is swiftly walking toward your fur-filled cart. Step 6: Wait, is this the same employee who told us to get off the washing machine earlier? Step 7: Hi, no, we're just looking, thanks! Thanks to our resident pHOT-DOGtog, Christina Slaton, for ensuring that we definitely weren't the oddest looking people in the store.